The Planetary Gems Co. : Providing auspicious, beautiful and potent astrological, Jyotish, Vedic gemstones to the discerning souls. About the Planetary Gems Company and its mission. About the Planetary Gems Co.
"To provide people with Jyotish quality, beautiful and sattvic, natural gemstones and astrological jewelry at or below wholesale/dealer prices. We believe that is possible to gain good fortune... without spending a fortune. Doing this with honesty, integrity and complete customer satisfaction.". To meticulously select fine, natural, untreated, Jyotish quality gemstones for Vedic astrology, Ayurveda and healing purposes, that are beautiful to the eye and vibrant to the spirit, in all at the lowest and fairest, wholesale prices. As everybody is claiming it, we do it. Says Rodolfo: " Especially in nowadays Vedic tradition, when dealing with astrological gems, the sincere seeker has two choices: Or getting Jyotish gemstones from India, which are of poor quality...flawed and badly cut, totally worthless both in terms of regular jewels and vibrational energy or getting them of higher qualities. Most of the time, the common belief of a high quality, Jyotish gemstone is busting the bank...which is not be necessarily that way. We guarantee that our high qualities, untreated, Jyotish gemstones are sold at the lowest and fairest, wholesale prices compared to the same quality offered by anybody else, in USA or any other location. Period." To make all customers feel satisfied and happy about their purchase. To display, grade and describe our products with utmost fairness and honesty. The pictures, taken under 30X magnification, show in great details the internal clarity, cutting, and exact color of each gem and piece of jewelry we display. This is very important, as usually, a very slight variation of color/clarity and cutting proportions can increase or decrease the price considerably. Here, you can see the stones you are getting at their finest details, unlike anywhere else. Everything is strictly, professionally graded following GIA standards according, to color, clarity, cut and country of origin. And many of our stones are 3rd party certified. To craft superior planetary, Jyotish talismans to please the eye and raise the spirit. Rodolfo is lately involved again in designing the talismans you will see on the site. It is his natural desire to craft beautiful designs for maximum auspicity and potent results. Be posted for future designs available. Each and every one will be strictly unique, one-of-a-kind and guaranteed powerful. The Planetary Gems Co. was founded in 1993 by Rodolfo Ciscato and his wife Sofija Jasna. As seekers of the spiritual path and practitioners of the TM technique, they became fascinated with sideral Astrology (Jyotish) in the late 80's. Before coming to USA in 1991, Rudy worked as gem buyer and jewelry designer for "Preziosi" Ltd.., in Verona, Italy. He has an organic chemistry diploma from the E.Fermi in Mantua, Italy. In USA, he graduated with a BA in Business Administration from MUM, Maharishi University of Management in Fairfield, IA. Sofija has a BA in management and a computer degree from Buena Vista University, IA. They have been living in Fairfield, Iowa for the past 27 years, but they spend their time in Fairfield, Chicago, Los Angeles and other places. They have a son, Adrian, born in Chicago. 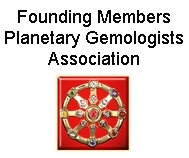 They are among the founding members of the Planetary Gemologist Association, with its headquarters in Bangkok. The Planetary Gems Co. strictly adheres to the PGA rules of professional ethics.